We have structured our programs to develop the important skills young people need including, perseverance, resilience, education, personal development, goal setting, skill development, group participation, team building, confidence, self esteem, leadership, fitness and community connection. Our Kokoda Track treks offer an innovative and safe educational travel experience, focusing on interaction with the local communities and developing a greater understanding of the diverse and rich cultural heritage of PNG. Our educational journeys help students develop a sense of worth and self esteem, along with concepts of teamwork, leadership, motivation, goal setting, self discipline, peak performance and shared responsibility- the crossing of the Kokoda Track is an enormous achievement. We also ensure it is heaps of fun! Our trips focus on the history of the track, community projects, including immersion, humanitarian, Duke of ED, and student empowerment and leadership projects. We have successfully led many hundreds of Students and more than 5000 trekkers across Kokoda since 2004. The experience of walking Kokoda is empowering and life changing. Wild Spirit Adventures prides itself on its professionalism of its staff, and its friendly and knowledgeable ambiance. Our staff truly makes all the difference and ensures that all our trekkers have a safe and memorable trek. Our priority is the safety of our trekkers. Our staff is focused on ensuring that all of our trekkers cross the Track safely and enjoy their experience. We provide comprehensive and informative pre trek information and have an exclusive training program and a comprehensive risk management plan designed specifically for our Kokoda adventures. Walking Kokoda with Wild Spirit Adventures across the wartime Kokoda Track is an experience not just a holiday. We see things as an explorer, historian and adventurer. When you trek Kokoda with Wild Spirit Adventures, you’re participating in a personal discovery experience; you are truly living and participating in an historic and monumental Kokoda adventure. Wild Spirit Adventures is or has been involved in a number of youth partnership roles including, the Kokoda Challenge Youth Program (KCYP). The KCYP is a program, which has been developed to help young Australians who are at a crossroad in their lives and require an opportunity to reach their full potential. Wild Spirit Adventures also continues its relationship with the MASP Youth Leadership Mentoring program in Victoria and has done so for the past four years. We have been heavily involved with Jobs Australia and their Indigenous Youth Leadership programs having led a group of Indigenous Leaders and Mentors across the Kokoda Track in their leadership program. Immerse yourself not only in theheroic and inspirational Australian Diggers battle stories, but also in the rich cultural heritage along the Kokoda Trail as we trek through local villages and spend time discovering the local customs and way of life of your local guides, their families, and the local villages along the Kokoda Track. Haileybury College, Newcastle Grammar, Berne School, Nhulunbuy High School, Rostrevor College, Murray High School, St Ignatius Riverview College, Hale School, Yarrawonga Secondary College, Mackillop College, Sunshine Coast Grammar, Victorian College of Deaf, St Luke’s Anglican Bundaberg, St Hilda’s College (Melbourne Uni) Y Lead, Ela Murray International School Port Moresby, Knox Grammar, Ravenswood School for Girls, Chancellor Park State College, Kokoda Challenge Association, MASP Youth Mentoring and Jobs Australia Indigenous program. We also work with Y Lead with their School programs. 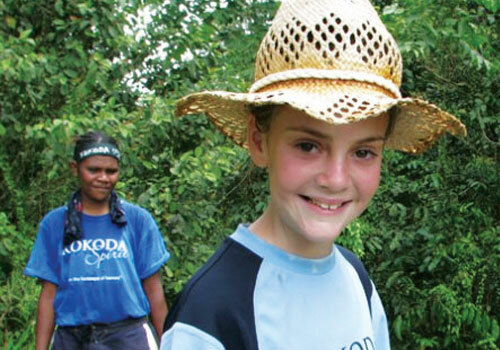 Every year Wild Spirit Adventures organises many expeditions for Schools across the Kokoda Track. The Wild Spirit school adventure is an authentic experience of different cultures, customs and landscapes where your students can develop a deeper understanding of the world around them and their own cultural heritage while still having fun. All the members of the trek had a great time, particularly the Buna extension. Adrian and the Buna boys were excellent. Having already done 6 Kokoda’s they are the best set of porters I’ve been associated with. Adrian as a lead guide was fantastic. The boys walked with the clients all the way and log crossings were roped well and they lead all clients across safely. The village stay was fantastic. The Mu Mu and Sing Sing were great and the guesthouse was very comfortable. Whether you want to understand the battles along the Kokoda Track,challenge yourself physically and mentally over the tough terrain, appreciate the rainforest at first hand, or immerse yourself in the culture of the local communities, we can create an innovative and safe itinerary with experiences that you just can’t get on a regular school trip. Our staff members are professional and qualified to lead these expeditions, and guarantee your expedition is everything and more than you expected! And as we arrange every detail, from meals, insurance to risk assessments, you can travel with piece of mind. We have been organising school trips across the Kokoda Track for over 10 years, we can even help you with the paper work to get approval. Our comprehensive ongoing support and training programs are tailored to your school’s specific needs to support the curriculum priorities you identify. If you are a teacher (or involved with a school) and are interested in hearing more about what Wild Spirit Adventures can offer, just email or call us to discuss your plans. Thanks for the great experience that you gave us on the Kokoda Track. We had a great time and learnt a lot. It was definitely one of the best experiences of my life. Many thanks. Hopefully your boy has now adjusted back to school life following his adventure across the Kokoda track. Thanks to all that have provided me with the wonderful feedback on the trip. No doubt, your boy has filled you in on all the events across the track. I am sure he has many wonderful memories that will stay with him forever. All would agree they have a heightened awareness and profound respect for the men that fought on the track and the sacrifice and support given by the Fuzzy- Wuzzy Angels; All would agree they have a greater appreciation and deep respect for the local people in Papua New Guinea, so happy and content, caring and considerate, yet with so little in earthly possessions. TNo photo could do justice to the wonderful relationships that were established between the porters and the boys. Contact Wayne Wetherall at Wild Spirit Adventures and we will be pleased to assist in planning, organising and facilitating your requirements.